That's right, the November Tournament will begin next Sunday the 12th! Aren't you excited? Koto'oushuu has changed his Shikona (sumo name) from 琴欧州 to 琴欧洲. Don't see the difference? Look at the last character, he's had a sanzui (water radical of 3 strokes) added on, but don't worry, it's still pronounced Koto'oushuu. Two of my favorite wrestelers Ushiomaru (Butterball) and Kitazakura (The Human Salt-Shaker) have moved back up from Juryou to Makunouchi, yeah! 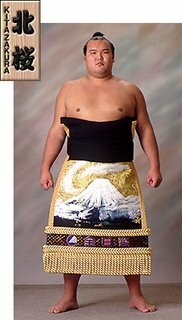 I was a little disappointed that my boyfriend Takanowaka didn't get re-promoted as well, seeing as how he took the division title last tourney, but I guess that's why I'm not a member of the Sumo Kyoukai.